With all the violence, illness and sadness in the world, the bright rainbow seems to be taking a sabbatical. “I’d rather listen to a Book on Tape than listen to the radio,” are comments I hear everywhere. The Ostrich Effect is alive and well; if I hide, it must not be happening. If it is happening I won’t know about it and don’t have to watch it unfold, one ugly incident at a time. Really? These words, universal to my ear, are spoken by tourists, who see only external factors and haven’t the slightest idea of what this hobby is really all about. Here is one small example. 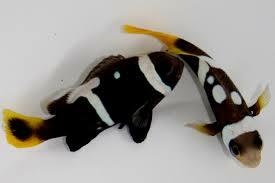 This afternoon my husband, Harvey, was troubled because his clown fish were attacking his red hawk fish. Clownfish, cute as they may be, are fiercely territorial, and any critter with fins and a tail had better not swim anywhere near their self-claimed backyard. Or front yard. Or underwater yard. Clownfish are those adorable striped fish who starred in Walt Disney’s popular animated film, “Finding Nemo.“ The fish Harvey has are more rare than the orange and white wiggly swimmers who endeared themselves to the public. 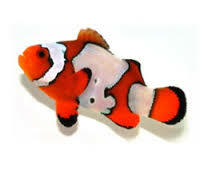 Our clownfish have the striped markings of their cousins but are white and chocolate brown rather than white and orange. They’re called “Designer Clownfish.” Their behavior suits their elite status. It is not relaxing to watch two fishy bullies attack a tank mate who gets too close for their clown sensitivities. 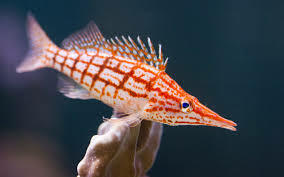 So, listening to the advice of the owner of the “Absolutely Fish” store, Harvey drove down to Clifton, NJ, to buy a pair of Damsel fish to distract the bossy clowns and keep the hawk fish safe. With great anticipation he made the round trip, acclimated the new fish for a half hour in an incubation tank and haltingly put one into the tank at a time. Did they attract the clowns? Did they distract them? Did they repel them? Hah! immediately, chasing them under the coral coves and out of sight. Watching the attack was unquestionably neither peaceful, relaxing or pleasant. Now not only is there bad news in the papers, on television, and on the radio. Now there’s bad news in the incorrectly assumed peaceful tanks somewhere in Morristown, NJ. Civil war is going on even as we speak. 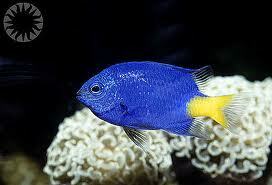 I call the salt water fish tanks “The Isis of the Sea.” Brutality knows no boundaries, on earth or in the ocean. I have a good friend who has seriously huge saltwater fish tankS in home; admittedly, they contribute to my general sense of ostrichitis. Love the humor here, on a day when (as you know) it’s hard to hide my head. Wonderful! I love the term you coined: ostrichitis. I vote to make it an acceptable English word. Interesting analogy, Ronnie. Sadly, those clown fish aren’t clowning around, and neither is ISIS. No, they’re not. I’d like to know; where are the real clowns when you need one? I love how you wrote this – a reminder that there is often more going on beyond what we first see. Those poor fishies though, they have nowhere to get far enough away! But in the full ocean they’d have much larger fish from whom to try to escape. That’s what my husband says. And that’s why he spends every waking moment caring for the fish tanks. The Ostrich Effect IS alive and well, I’m sorry to say. Sorry ’bout your fish. I love watching them, and feel so blessed I live in Hawaii where the biggest saltwater tank ever is 10 minutes from my door! Aloha, Ronnie. Do you ever snorkel out in that biggest saltwater tank in the world? Almost every day, Ronnie. Except during winter when the sea’s too rough. Still, it’s worth going out to ‘hang’ and listen to whales underwater. So cool! Found it rather amusing that fish can have their wars just like humans. Wonder if we look peaceful from the outside? Who might be watching us? It might sound amusing that fish have wars just as humans do. Watching it happen before your eyes is certainly not amusing. Fish tank owners will inform customers which fish not to put together in one tank. Since I’ve never been a member of the fashion elite I’m not really sure how tough they are. Years ago I kept several tanks of tropical fish. One day my EX brought a bluegill home from a nearby pond and put it in a tank. The bluegill ate everyone. End of my fish story. Oh, no! What a shocking surprise! Hmm; I wonder which humans you mean. It might be fun to try it. It’s so true, Rob. You have to know which fish get along. There are certain ones you would never put together in the same tank. But then there are the surprises that can ruin the entire tank community. Don’t think her eating all your fish is exactly the solution you were thinking of. Maybe I’ll ask the dog next door for his suggestions. I don’t have high hopes for the dog’s solution either. But I often secretly agree with your cat. 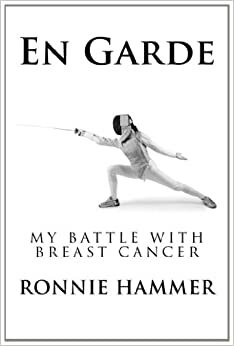 Showed it to Robert and we both love this story. We propose a two state solution. Give Isis a tank of its own. Brilliant! This is an idea that could be used in human solutions, too. Yes, you probably have some good and some bad memories of that experience. Illusion, delusion, willingly, consensually naive, that is the realm of the audience, the stage hands make adjustments, attempt to play grandmaster with science, alter patterns of aquatic history, which side of the HOBBY is viewed, VANTAGE POINT makes ALL the difference. How true, Lynn. I prefer seeing the tanks the way the naive folks do, and assume that fish tanks are peaceful places. Fish, the metaphorical ISIS. Perfect. And we thought life was tough when our girls came home with goldfish party favors. Well written, Ronnie. …and I thought it was a problem when the children fought. Although it may have sounded brutally noisy I don’t recall having fears of murder occurring in the playroom! Are you entering the new world of fish-mind reader? Especially if things slow down in your pediatric practice. I hope they figure out how to make the peace soon so to give you some peace too!